Customize a level system to suit your application requirements. The F7-MLK Multi-Level Switch Kit contains all the components necessary for the design and fabrication of a 1 or 2 station level switch for pipe plug mounting. User can customize stem length (max 36"), actuation point, distance between floats, and lead wire lengths. 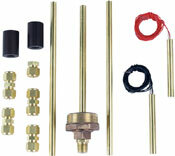 The switch kit is ideal for general purpose, low specific gravity, and gas and oil applications. Model F7-MLK includes two level stations (switch, tube, and Buna-N float), two brass extension tubes 12" length, four brass tube unions, one end fitting, and one mounting plug.